You may remember Cauliflower, our veggie queen and proud mama of six adorable kittens. As kitten season is now underway, we thought we’d provide an update on the veggie patch kittens – Kale, Parsnip, Cabbage, Courgette, Broccoli and Brussel Sprout – and explain why we think it’s so important to adopt in pairs. All the veggie patch kittens were adopted in pairs, allowing further kitten-to-kitten interaction and playtime to help them develop important social skills. Kale and Parsnip, now Magnus and Bjorn, are prime examples of how kittens help each other develop social skills. For example, Magnus has shown Bjorn the simple way to get more pets: climb all over the humans. In return, Bjorn confidently showed Magnus their new food was delicious when it became time to change their eating habits. The two lean on each other during kittenhood, being the strength to the other’s weakness. Another advantage of adopting two kittens is they can entertain themselves when humans aren’t around. As Bjorn tends to be more independent, he’ll entertain himself with a toy mouse for a while before playing around with Magnus. When the fun and games end, there’s always a cuddle session! In general, Magnus and Bjorn have grown much since the first day they were adopted. They’re both around 8 pounds each, but Bjorn’s closer to 9! They’ve both been neutered and Magnus has had his congenital abdominal hernia repaired. Bjorn’s also developed into a strong, silent type, which is a change from the rambunctious kitty he was at his foster home! He’s smart to assess a situation and make a calculated decision before acting, whether it’s pouncing on his brother or jumping into the nearest lap. Magnus continues to be the fool-hearted, fearless kitten he always was. They’re both so loving and are always longing for never-ending belly rubs! Want to see more Magnus and Bjorn? You can follow them on Instagram here. Cabbage and Courgette, now Guinness and Bailey, have grown into extremely playful kittens that like to ride the floor sweeper while the humans dust the floor! The two kitties spend most of the day with each other, cleaning each other when taking a break from chasing one another all over the house. Having another kitty around means they can help clean each other’s ears and head, areas somewhat difficult to reach. The two are able to entertain each other and themselves, but prove to be very social when they’re guests around. As for what they’re up to these days, Guinness has been neutered, but Bailey has a small heart murmur so her family are awaiting test results before she goes in for surgery. The two kitties enjoy sitting at the front window, watching the birds and bugs fly outside. They’re obsessed with the numerous toy mice they have, especially the ones that rattle. They’ve been a wonderful addition to the family and they’re “parents” say it’s been amazing watching them grow and learn from each other. Broccoli and Brussel Sprout are the best of friends. While play fighting has become a pastime, they also find entertainment with the kids of the house. They don’t mind being carried around and Brussel Sprout has even slipped on a pink dress without any sign of being bothered! As kittens, they respect each other’s space, but Broccoli is clearly the boss, acting like a wise, older brother (well he is two weeks older!). They clearly love each other and are always in the same room. When one meows the other is sure to come running! They both love their treats and food and Brussel Sprout has proven to be the fastest eater of the furball kingdom! In other news, Broccoli and Brussel Sprout have both been neutered and didn’t even need to wear cones of shame! They both bounced right back. 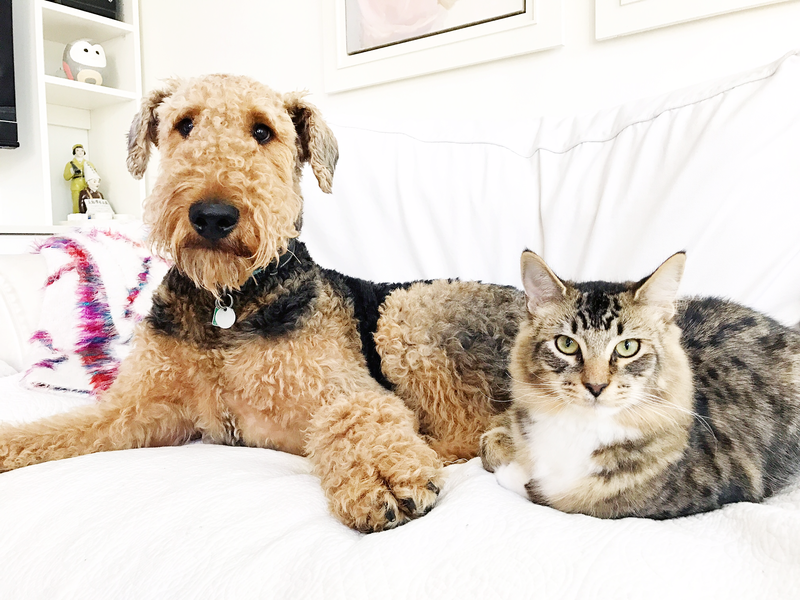 Broccoli’s in love with the resident Airedale of the house, George. They cuddle in George’s bed and are constantly licking each other – call it instant friendship, if you will. However, Brussel Sprout is not a very big fan of George. The two cannot be left to their own devices together as George can’t understand why Brussel Sprout doesn’t want to be friends. He’s been on the receiving end of many of Brussel Sprout’s jaguar-like swats. So the patient introduction continues and once they find some common ground, everything’ll be golden! The kittens have been an amazing addition to the family. While Brussel Sprout is a little naughtier and keeps the humans on their toes, they wouldn’t change a thing. Watching the kids bond with their dog and kittens is the sweetest thing one could ever hope for. Unconditional love from a pet is the best. You can follow Broccoli and Brussel Sprout’s adventure on Instagram here. As kitten season continues, we want to urge those wanting to adopt to adopt in pairs. The veggie patch kittens’ stories are examples of how advantageous, beneficial and sweet it can be to have two furballs in a household. 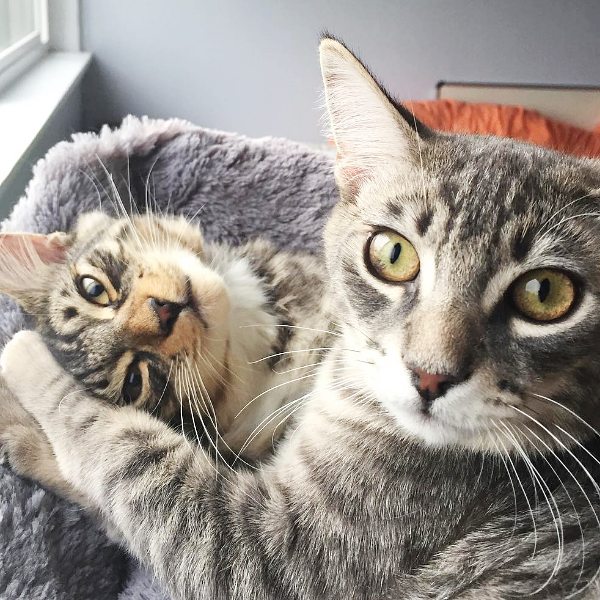 Our mission at VOKRA is to ensure all kitties get the furever home they deserve, and you can help by adopting in pairs to give them not only a loving home, but a lifelong best friend at their side. Click here to learn more about adopting through VOKRA. Byron came into VOKRA’s care after he was found as a stray in an industrial park. Street life was starting to take its toll on him – he had some battle scars that were likely caused from run-ins with other animals. However, a tough life on the streets didn’t dampen Byron’s affectionate and playful nature. Even though he was in good health, it was discovered Byron was feline immunodeficiency virus (FIV) positive. Byron’s diagnosis didn’t affect his overall health, but it did mean he couldn’t go to a home with another cat. Byron’s second chance came when his future adopter, Rebecca, decided it was time for a kitty to come into her life. After reading about Byron’s background and biography online, Rebecca knew this was a kitty she wanted to meet. “I thought he might be a guy who could do with some stability and some pampering,” she said. Byron and Rebecca hit it off and he soon found himself in a new forever home. Thanks to his amazing foster dad Bill, who brought his toys and cat things to Rebecca’s home, Byron settled in quickly and was king of the castle before long. Besides watching the clock for mealtimes, Byron has discovered his people make wonderful places to sleep on. He also has a love/hate relationship with his favourite catnip toy (he beats it around then cuddles with it when he naps). We’re so glad Byron found a safe and happy place to call home. Thank you to Rebecca and her husband for giving a second chance to this wonderful cat. Kitten season is off to a record start! This beautiful girl is April and she’s the proud mama of 10 healthy kittens. Yes, 10 kittens! This is the first time in VOKRA history a mama has successful delivered 10 healthy babies. 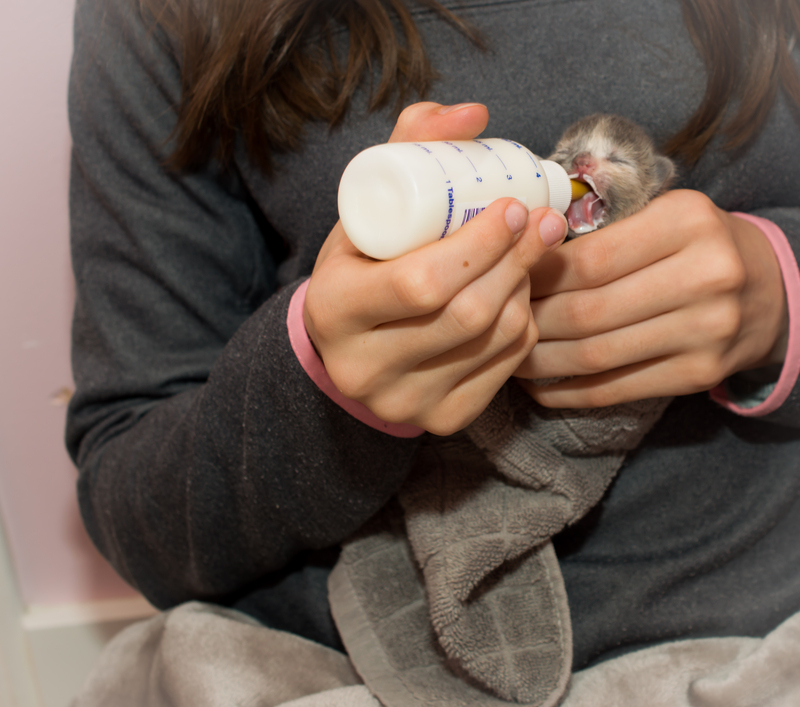 Each year during kitten season more than 900 kittens are born in our care. And if April’s litter is any indication, this season will be no different. 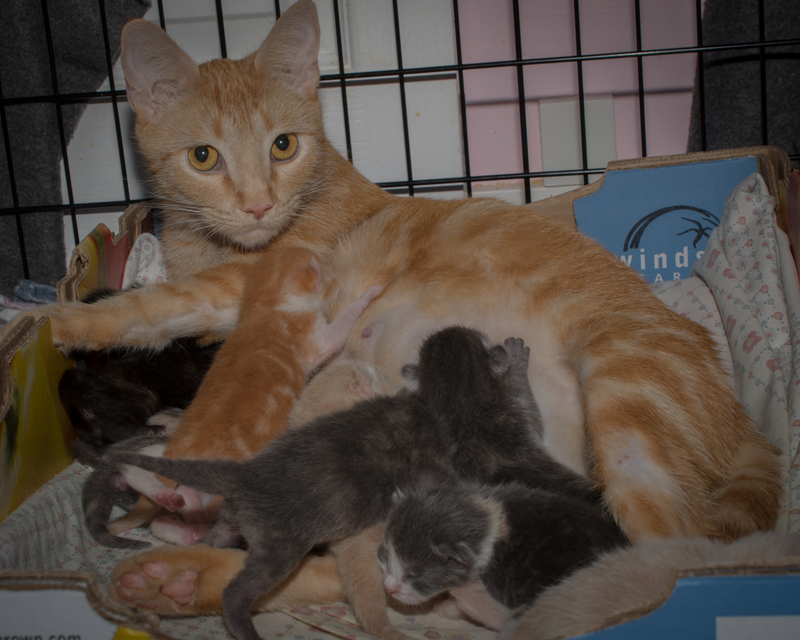 As a volunteer-driven non-profit, we can’t support this many kittens without the help of people like you. Kittens in our care have a chance at a happy, safe and healthy life. With so many kittens, April isn’t able to care for them all on her own. She simply doesn’t have enough milk to support this many babies and, if she would have given birth on the street, it’s certain some of them would not be alive today. Thankfully we were able to rescue April in time and she gave birth in a safe space. 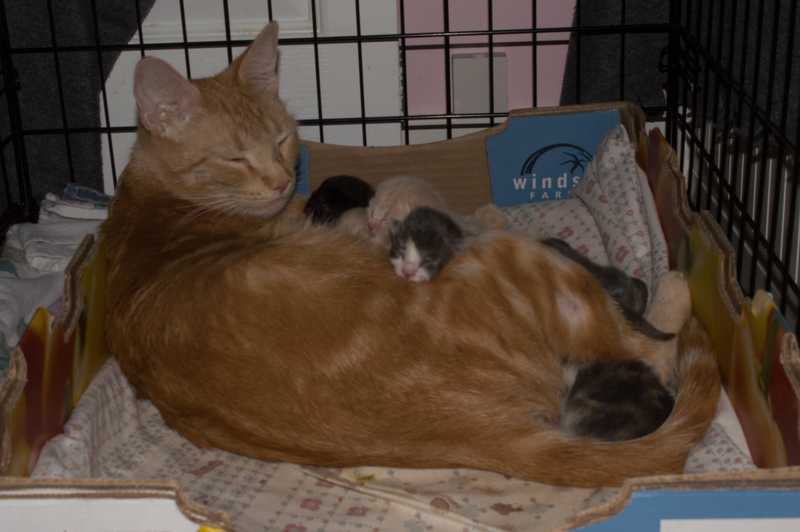 Her foster mom Brenda is ensuring all the kittens get enough to eat through bottle feeding so everyone’s thriving. Between the cost of special kitten formula and supplements, nursing kits and medical care we anticipate the cost to support each of these kittens is more than $150. That adds up to more than $1,500 just for this litter alone. Your support today will help us buy extra food and litter, and will also pay for veterinary care and medication. Please donate today to help save kittens like April’s. A special thank you to Laureen Stokes for taking the photos of April and her family! April showers bring May flowers…right? While it has been a rainy April we’re sure hoping for the sun to shine for everyone in May! But at VOKRA we’re lucky because we get sunshine everyday from all our lovely volunteers and it’s time to celebrate our Volunteer of the Month – Marlene Smith! 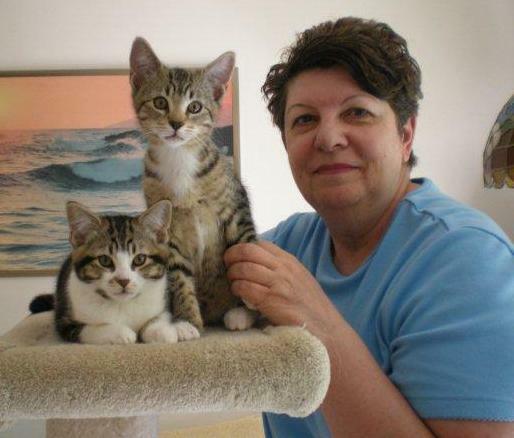 Marlene has always been a cat lover, having been involved with several cat rescue organizations. She joined the VOKRA volunteer team more than four years ago at an adoption event. 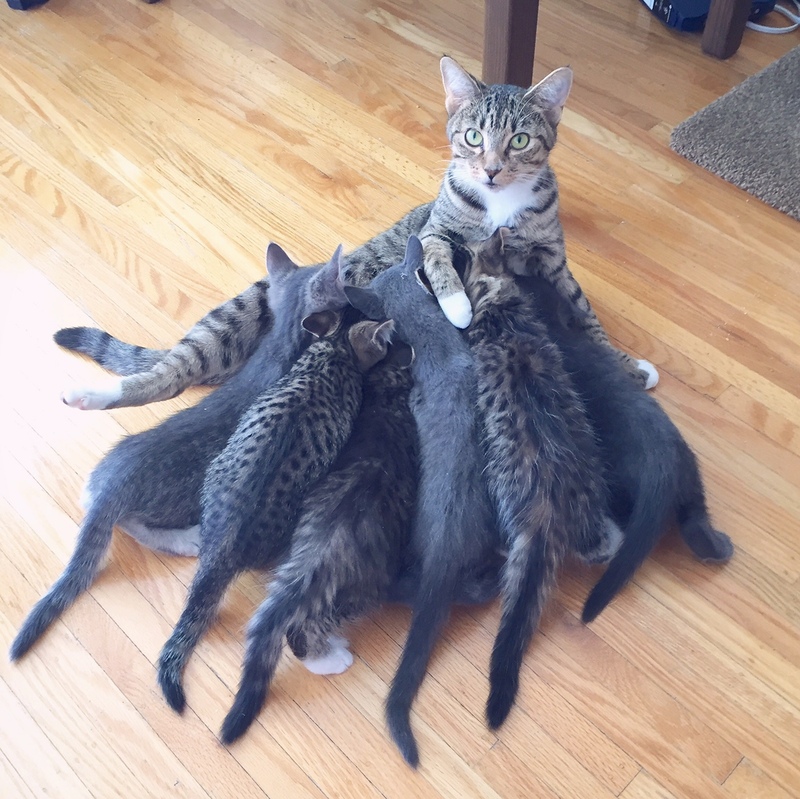 She fostered a few cats here and there for a couple months, but decided not to continue due to her resident cats being less than amused by the lack of attention they were receiving. However, over the years she’s picked up short-term fostering again until longer term fosters can be found in Surrey or Vancouver. Working from home, Marlene takes on many tasks at VOKRA. She enters health and medical information of kitties into our database, handles calendar distribution in Surrey and organizes community and fundraising events. As well, Marlene assists with the collection of donations, preparing tax receipts and documenting payments for online auctions. The volunteering doesn’t stop there! Marlene has also administrated and reported on two spay/neuter grants for VOKRA in Surrey. Marlene truly is a hard worker, helping with emergency pick-ups and driving calls for injured cats or kittens that need a fast trip to the vet or our Operations Centre – no speeding tickets so far! She also prepares adoption papers in Surrey and meets with adopters. It’s a great way to meet people and share the information VOKRA provides during the adoption process. Marlene is happy to volunteer with VOKRA, along with all the great volunteers who are associated with our organization. We too are over the moon to have Marlene as one of our volunteers. So, this month, we’re celebrating Marlene Smith as our wonderful Volunteer of the Month! Thank you for all your hard work and dedication to VOKRA!